COLUMBUS, OHIO - The Columbus Blue Jackets have signed left wing Brandon Saad to a six-year contract through the 2020-21 National Hockey League season, club General Manager Jarmo Kekalainen announced today. As is club policy, terms were not disclosed. Saad was acquired by Columbus from the Chicago Blackhawks along with center Alex Broadhurst and defenseman Michael Paliotta on Tuesday. 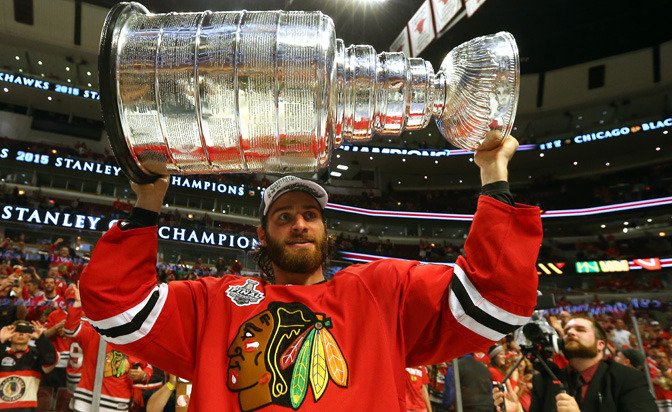 Saad, 22, has posted 52 goals and 74 assists for 126 points with 44 penalty minutes and a +44 plus/minus rating in 208 career NHL games and added 15-19-34, 16 penalty minutes and is +16 in 67 career playoff games, helping Chicago win a pair of Stanley Cup championships in 2013 and 2015. “Adding a player of Brandon's caliber is exciting for the Columbus Blue Jackets organization and our fans and we are extremely pleased to have reached this long-term commitment that assures he will be an important part of our team for years to come," said Kekalainen. A native of Pittsburgh, Pennsylvania, Saad was Chicago’s fourth pick, 43rd overall, in the 2011 NHL Draft. Last season, he collected 23-29-52, 12 penalty minutes and a +12 plus/minus rating in 82 games, ranking third on the club in goals and fourth in points, while his six game-winning goals was second to the seven scored by Jonathan Toews. He added 8-3-11 in 23 playoff games to help the Blackhawks win their second Stanley Cup title in three seasons.